The newest revelation out of The Walking Dead could hint at coming doom for Rosita (Christian Serratos), Father Gabriel (Seth Gilliam), Siddiq (Avi Nash) or Eugene (Josh McDermitt). Sunday’s mid-season premiere revealed Rosita is pregnant with Siddiq’s child, the result of a carefree fling from just before Rosita coupled up with Episcopalian priest Gabriel. In creator Robert Kirkman’s comic books — which have long been referenced as a guide more than an exact blueprint — Rosita’s pregnancy was revealed during the general period now playing out in the show. The books saw Rosita become pregnant by Siddiq as result of an affair, not a fling, while she was in a relationship with Eugene. Eugene then pledged to take care of Rosita and raise the baby as his own, but he would later be devastated when — spoilers — Rosita was one of many victims of the Whisperers. The new enemy group was revealed to have abducted a dozen survivors from across the aligned communities, leaving their decapitated heads on pikes as part of a twisted border marker to be discovered by a horrified Rick Grimes, Andrea, Carl, and Michonne. Could this fate be in store for Rosita’s live-action counterpart? The Walking Dead often proves subversive with its main deaths, only rarely giving show characters their deaths from the books: Glenn’s (Steven Yeun) was faithful, playing out as it did in the comic as a victim of Negan (Jeffrey Dean Morgan), while Shane (Jon Bernthal) and Hershel (Scott Wilson) received similar — albeit not exact — deaths from the books. Other deaths, like Abraham (Michael Cudlitz) and Carl (Chandler Riggs), deviated completely from the source material. More changes have already played out in The Walking Dead Season Nine, including Gabriel taking over a comic book plot belonging to Eugene. There it was Eugene who restored a radio he then used to reach out to distant survivors, eventually bringing him into contact with Stephanie, a member belonging to a group now at the center of the comic book’s main storyline. But one thing remains constant: not all of the survivors making up the “love quadrangle” — showrunner Angela Kang’s term for the murky waters now being navigated by Rosita, Gabriel, Siddiq and Eugene — are making it out alive. The Walking Dead previously shied away from killing a baby when it let Judith Grimes (now played by Cailey Fleming) survive past Season Three; in the books, a newborn Judith was killed alongside mother Lori during the Governor’s assault on the survivors’ prison camp. Whether or not the television show has the guts to depict the decapitated head of a pregnant woman, Rosita may be spared her comic book fate only because of the show’s penchant for deviation (and an already dwindling amount of longtime stars). 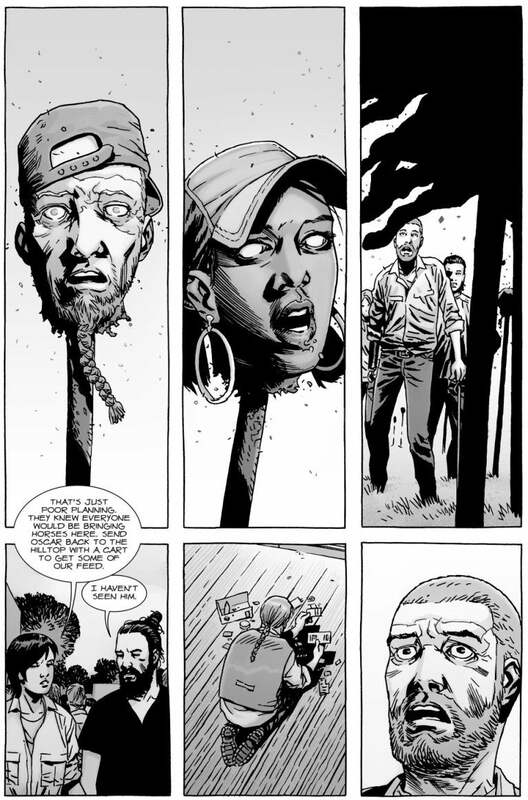 That leaves Gabriel, Siddiq, and Eugene as candidates for Rosita’s gruesome ending.